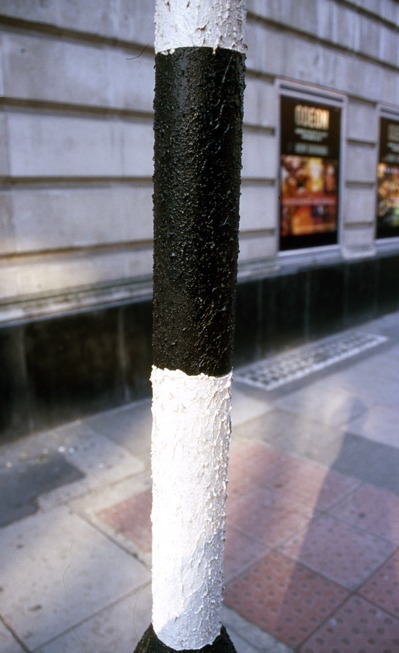 A thick wax based paint applied to street furniture, lamposts and other fixed objects to prevent the application of small stickers and posters. This paint appeared on many London street surfaces in the late 1990s. Starting as a very thick impasto it has now been refined with a much finer tooth. It comes in different colours depending on the surface it is applied too. Its early thicker manifestation became dirty very quickly as pollution would collect on its rough surface. It is now more fine, with the slick look of seal fur. The paint dries hard.